Although the vast majority of the text that you add to Photoshop artwork is point type — that is, type that exists on just one or a couple of lines — you’ll certainly find situations in which you need to use paragraph type in a type container. The primary advantage of using paragraph type is word wrap. While you type, the text automatically starts a new line every time it reaches the margin. “Why is that a big deal?” you might ask. “I don’t mind pressing the Return or Enter key at the end of each line.” Ah, but consider the ever-present typographical error! Or what if the very first sentence of your manual-Return paragraph is missing a word? To insert that word and maintain a visually pleasing right margin, you’d need to go back and redo every line of type. With paragraph type, the content of each line automatically adjusts as you insert that forgotten word. The type automatically starts the next line as soon as you press enough keys to reach the far margin. You can keep typing until you fill the type container. Press Return or Enter whenever you want to start a new paragraph within your type container. You can also copy/paste text from a word processing or text-editing program. You can, for example, open a Microsoft Word document in Word, select the text that you want by clicking and dragging, and then choose Edit→Copy to place the text into the computer’s memory (on the Clipboard). Switch to your Photoshop document; select a font, font size, and other attributes (or select a character style or paragraph style after pasting); drag a type container; and then choose Edit→Paste (or the assigned keyboard shortcut) to place your text inside the container. When the text you need already exists, you not only save time by using copy/paste, but you also eliminate the possibility of introducing typos. But what if you have more text than fits in the type container? Unlike Illustrator and InDesign, you can’t link two type containers, enabling the excess text to automatically move to the next container. Photoshop does, however, remind you that your text doesn’t fit by showing you a symbol in the lower-right corner of the type container’s bounding box — the dashed line surrounding the type container. As you can see in this figure, the lower-right anchor point of the bounding box has a plus sign in it. Enlarge the type container. Click one of the bounding box’s anchor points and drag to increase the size of the type container. Making a type container a little bit wider often gives you an extra line or two of text at the bottom. Shrink the font. Select the text with a keyboard shortcut (Cmd+A/Ctrl+A) and select a smaller font size on the Options bar. Decrease the space between lines. 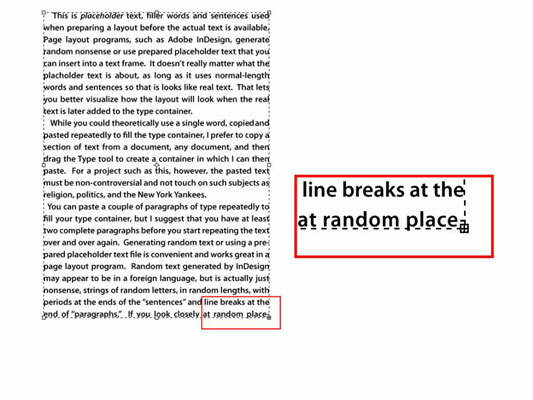 Select the text and decrease the leading — the amount of space between lines of type — in the Leading field found in the upper right of the Character panel. By default (the Auto setting in the Leading field), Photoshop uses an amount equal to 120 percent of the font size. You can often reduce the leading to 1 or 2 points larger than the font size before you start overlapping lowercase letters with descenders (g, j, p, q, and y) and uppercase letters on the line below. Edit the text. Rephrase the text, using fewer words to convey the same message. If you’re not the author, however, this option might not be available. You can also use a path created with any of the Shape tools or the Pen tool as a type container. Select the tool, use the Options bar to set it to create a path (rather than a shape or pixels), then drag the tool in the image window. With that done, switch to the Type tool, click within the path, and add your text.